Photograph courtesy Jerry Glover. 25326 at Bletchley on September 6th 1981. The seventeen year nine month career of D7676/25326 was spent allocated to London Midland & Western Region depots. Blue & yellow livery from new. Time between withdrawal and scrapping: 13 months. July 1967 to Carlisle Upperby (12B). February 1968 to Carlisle Kingmoor (12A). May 1968 to Longsight (9A). May 1972 to Cardiff (86A). May 1978 to Springs Branch. 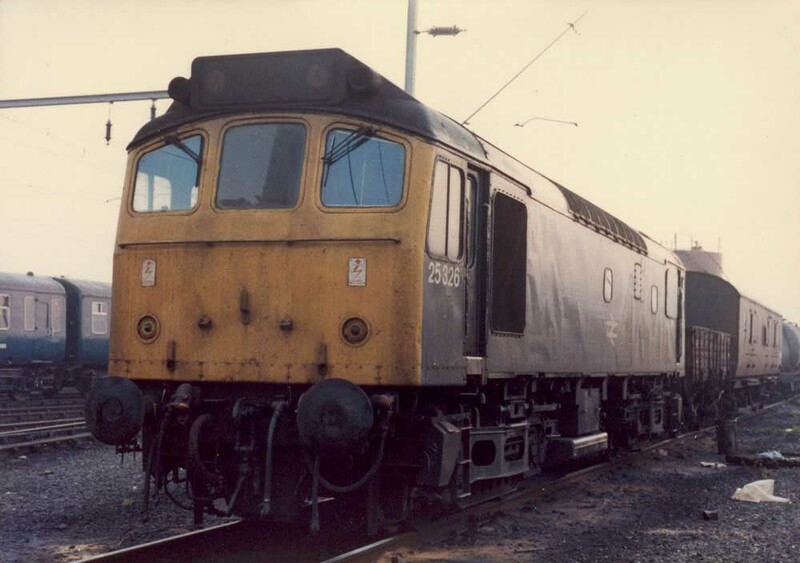 25326 was the 232nd Class 25 withdrawn, one of five retired during January 1985. After withdrawal 25326 was stored at Cricklewood until May 3rd 1985 when it moved to North Acton with 25075, 25219 & 25306, then to Swindon on May 14th 1985 and into the Works the next day. By the end of February 1986 25326 had been scrapped. Noted Derby Works October 1974. Noted Derby Works February 1978 (Classified & dual brake equipment fitted). June saw the frames laid at Derby for the last batch of Class 25's, D7660 - 7677, under order number 11001. These were part of an order given to Beyer Peacock but their worsening financial position led to the company asking for a release from the final eighteen machines. D7676 was delivered to the Nottingham Division (D16) during April, being delivered new in blue livery with full yellow ends. D7671 - 7677 were transferred to Carlisle (12B) during July, as part of the manouevring of the diesel fleet to eradicate steam in the north west. On February 17th 7676 worked the 12.18 Glasgow Central - Manchester Victoria forward from Preston. The 10.00 Sheffield - Llandudno Town and the return 14.28 Llandudno Town - Sheffield were worked by 7676 on August 9th. On August 29th the 09.20 Manchester Piccadilly - Yarmouth to Lincoln Central and the return 09.28 Yarmouth - Manchester Piccadilly from Lincoln Central were worked by 7676 & 5200. Photograph collection of webmaster. 7676 at Sefton Junction sometime in 1971, presumably prior to its move to the Western Region. The Class 25 still carries its 'D' prefixes and looks like its still carrying its original livery as applied from new. A Works visit must be near. In a reshuffle of power to assist in the removal of the hydraulics on the Western Region 7675 - 7677 were transferred to Laira (84A) during October. By January 7676 & 7677 were at Bristol (82A), then 7675 - 7677 were off to Cardiff (86A) in May. By the end of the year the three of them were back at Laira (84A). During 1970 D5179 - 5182 went to Ebbw Vale for testing in multiple on the 63 mile Port Talbot - Ebbw Vale iron ore trains, which included the six mile 1 in 80 gradient between Aberbeeg and Ebbw Vale, often requiring a restart at Aberbeeg. 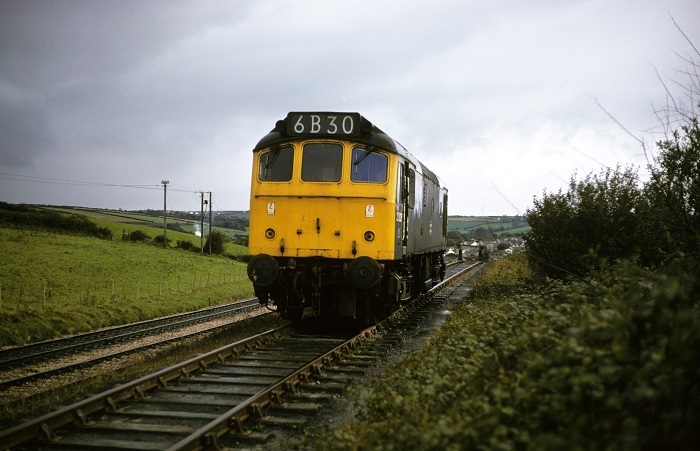 These services highlighted known weaknesses with the Class 25's traction motors especially when worked in multiple. The 25/1 & 2 subclasses had field weakening controlled by the engine governor and main generator field strength whilst the 25/3 subclass had speed induced field weakening. Should a trailing unit have improperly functioning field weakening it was possible for the motors to sustain major damage without the driver's knowledge. In addition the margin between the continuous and short time ratings for the motors was minimal. Remedies for this involved strict maintenance, driver education, avoiding mixing 25/3's with earlier machines or reducing trailing loads if that happened. As a result on these workings the 25/1's had their maximum tonnage reduced from 930 tons to 810 tons. Tests using 7569 & 7676 in June and October 1972 specifically identified the sub-class variations as the main weakness. This was especially true in the field divert relays and their poor adjustment. Other areas of concern were faulty traction motor blowers, overly high engine governor settings, load regulator switches failing in the closed position, thus giving fluctuations and excessive current. On the similarly heavy Tunstead - Northwich limestone trains a heavy toll was taken on the traction motors. 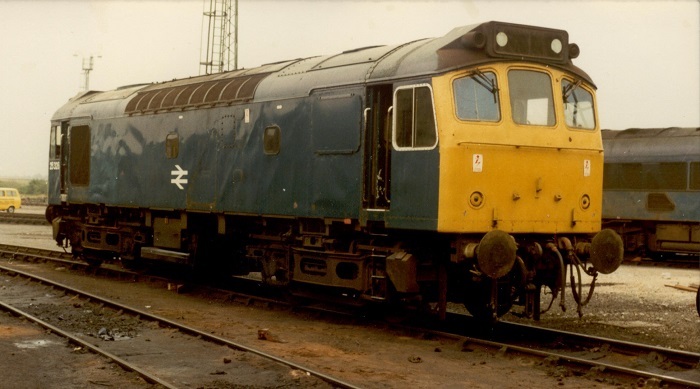 During the 1970's traction motors were failing over 200 times per annum, the LMR alone changing 66 in 1975 and 121 in 1976 including eleven machines having all four motors changed. Whilst the small motor may have been easy to work on it still required a lifting of the body to change it out. As motors were connected in series parallel flashovers might occur in sympathy and could lead to a main generator failure. In 1976 an attempt to resolve the problems involved 25088 being fitted with a redesigned field divert contactor and adjusted field divert resistor with the main generator altered to Class 25/3 specifications. (Such were the results of the testing of 7569 & 7676). On April 7th the 1E54 14.05 Plymouth - Leeds City saw Class 45 No.36 piloted by 7676 at least as far as Bristol Temple Meads. On March 28th 7676 worked the 2B84 20.10 Exeter St Davids - Newton Abbot and was then booked to return light engine to Exeter stabling point. On August 4th 7676 worked the 09.51 Exeter St Davids - Barnstaple and the 12.20 return. On September 1st the 12.45 Penzance - Cardiff was worked to Plymouth by 7676 & 7625. A Barnsley - Barnstaple day excursion (1Z25) on October 6th utilised 7676 & 7677 over the Exeter St Davids - Barnstaple - Exeter St Davids portion, on the return leg 1624 took over for the run north. On July 24th the 20.15 Exeter St. Davids - Newton Abbot was worked by 25326. Photograph courtesy Roger Geach. 25326 at Liskeard on September 29th 1974, at the Up Goods Yard, now the site of a car park. After nearly four years on the Western Region 25326 was transferred to Crewe in August. A short lived summer diagram involved the 07.19 Bangor - Manchester, the 12.42 back to Llandudno and the 18.40 return to Manchester, then ecs to Bangor. Most frequently in the hands of a Class 40, 25327 worked the diagram on August 25th. 25325 was noted in Derby Works during September. 25326 visited Derby Works during February. It was transferred to Springs Branch during then to Cricklewood in July. On February 27th a St. Pancras - Sheffield failed at Leicester behind a Class 45, 25326 took over to Derby where 45008 took over. A Stoke-on-Trent - Skegness service was worked by 25326 & 25191 on July 1st, the stock returned as an empty coaching stock move. On July 22nd the 04.15 Shrewsbury - Aberystwyth and the 10.07 Aberystwyth - Euston to Wellington were worked by 25326 & 25313. At Wellington both Class 25s failed and were dragged to Wolverhampton by a Class 47. On August 19th the 08.43 Scarborough - Sheffield was worked by 25326, normally a Class 31 or 37 turn. On July 4th a Nottingham - Lowestoft special was powered by 25307 & 25326, or was this a Northampton - Lowestoft on July 5th with 25037 & 25326?? January 19th found 25315 in trouble on the northbound Fletliner, suffering a seized traction motor at Wellingborough. Assistance arrived in the shape of 47149, replacing the defective 25 and sister 25326. On March 19th the 11.08 St. Pancras - Nottingham failed behind 45143 at ? ?, 25326 dragged the service to Nottingham. 25315 & 25326 were noted at Forders Siding on August 1st. 25326 was noted at Euston with coaching stock on January 26th. 25326 received an E exam at Cricklewood during May. 25313 & 25326 worked the northbound Stweratby - Garston 'Fletliner' on August 3rd. On September 6th 25326 was stabled at Bletchley. A week later on September 13th the 00.25 Manchester Piccadilly - Euston was worked between Bletchley & Willesden by 25326 & 25278 due to the power being off for engineering work. On October 30th 25326 worked the 08.22 Barrow - Blackpool North. Whilst working the 16.17 Newcastle - Cardiff on December 11th 45038 failed in the Chesterfield area, 25326 whilst still attached to its Speedlink freight train pushed the service to Chesterfield station where 47374 took over. 25326 was stabled at York on January 13th. 25326 was noted at Euston on February 12th. On March 2nd 25312 & 25326 were noted at Nuneaton on a stone train, two of seven Class 25s present in the Nuneaton station area at the same time. On May 21st the 09.03 Cambridge - Birmingham New Street was worked forward from Oakham by 25326 after 31133 failed, returning with the 16.17 Birmingham New Street - Norwich as far as March. On May 24th 25326 was noted at Peterborough with empty ballast wagons. It was a busy weekend for 25326 & 25321 on August 7th & 8th. On 7th they worked the 10.10 Euston - Aberystwyth from Birmingham New Street, returning with the 16.05 Aberystwyth - Shrewsbury. The next day (8th) they worked the 08.45 Birmingham New Street - Aberystwyth from Shrewsbury, the 16.40 Aberystwyth - Machynlleth and 17.25 Machynlleth return and the 18.15 Aberystwyth - Euston to Wolverhampton. A week later on August 14th the 08.10 St. Pancras - Leicester was worked forward from Bedford by 25326. Two days later (16th) the 08.04 Birmingham New Street - Norwich was worked from Leicester to March by 25326, which had replaced 25086. 25326 was noted at Nuneaton on December 29th. On January 8th a Euston - Blackpool North service was worked forward from Preston by 25326. Stabled at Northampton (or passing throught light?) on March 9th were 25326, 31121, 31212 & 37242. The 08.00 Liverpool - Euston required assitance as far as Crewe on March 18th from 25326 due to the power being off because of overhead line damage. On May 19th the 08.05 Liverpool - Newcastle required the assistance of 25326 between Manchester Victoria & Leeds, here 45060 took over. On May 18th 25326 was the Manchester Victoria pilot. On May 23rd 25326 was noted southbound at Warrington Bank Quay station with a short freight. 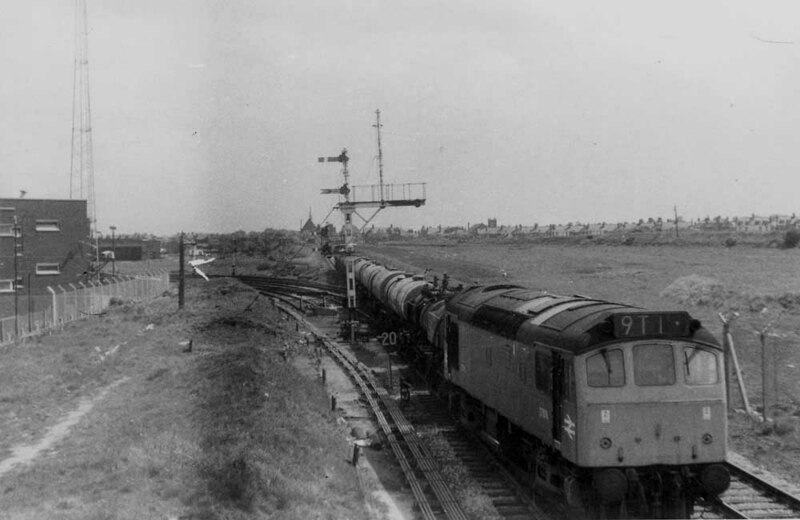 On June 3rd 25326 & 25313 worked the Ellesmere Port - Exeter Riverside tar tanks. The diesel multiple unit working June 22nd's 06.00 Crewe - Cardiff failed at Shrewsbury, 25326 worked the service forward. 25326 moved to Crewe in July, this would be its last transfer. Photograph courtesy Jerry Glover. 25326 at Thornaby on July 17th 1983. 25326 was noted at Warrington Arpley Low Level on October 10th with a short freight. A short working took place on December 29th when the relief 10.05 Penzance - York failed at Northfield behind 45063, the service was dragged to Birmingham New Street by 25326. On February 5th 25326 & 25265 hauled the 23.05 Euston - Nuneaton relief northwards from Northampton. The end of March saw much continued activity of Class 25's in the North East including 25326 working the Haverton Hill - Stevenston tanks on 23rd. On April 18th 25326 was noted at Deansgate Junction with a train of loaded ICI hoppers. 25326 was noted at Preston station on August 6th and at Ladywell sidings on August 8th. On August 25th 25326 worked an early morning Manchester Piccadilly - Crewe relief, this is believed to be 25326's last passenger working. 25326 was noted at Manchester Victoria on September 29th. 25326 was withdrawn on January 23rd 1985. No.1 cabfront: rust patch beneath left handside miscellaneous bracket: September 1984 until withdrawal. No.2 cab 2nd man's cabside: unpainted window frame: May 1982 - October 1983. No.2 cabfront: two rust patches, above handrail below driver's window and on column between driver's window and center window: May 1983 - August 1984. Page added June 13th 2003. Last updated July 27th 2018.